The light fixture has 1 white, 1 black and a ground. I'd appreciate help wiring this light, and also just understanding what is going on with this setup. I don't have a wire tester at the moment, but as soon as it isn't so icy I'm going to go get one. Edit: the small piece of wire fell out when I was taking the light off, I think it was connecting a couple of these other wires. Color distinguish wires in cables, it does not connote wire function. If you want the latter, you can mark wires with tape. There's one exception, neutral wires must be white but white wires don't have to be neutral. So the all-white gaggle must be neutral, and since your lamp actually does need neutral, your lamp white should go there. The pigtail probably fell out of that. The black-white gaggle cannot be neutral, since black cannot be neutral. Therefore neither can the white wire. This is surely an always-hot wire, going onward to the switch in a switch loop. The third most recent Code change requires in switch loops, white must be the always-hot, so it is obviously hot and is not confused with neutral*. Grounds are simple, all grounds connect together. Green, yellow/green and bare a reserved for grounds and vice versa. That leaves the two blacks plus the black on the lamp. These are all accounted for: one is switched-hot from the switch. One is onward power to the other lamp. The third is obviously the lamp. All these go together. Not the answer you're looking for? Browse other questions tagged wiring lighting or ask your own question. 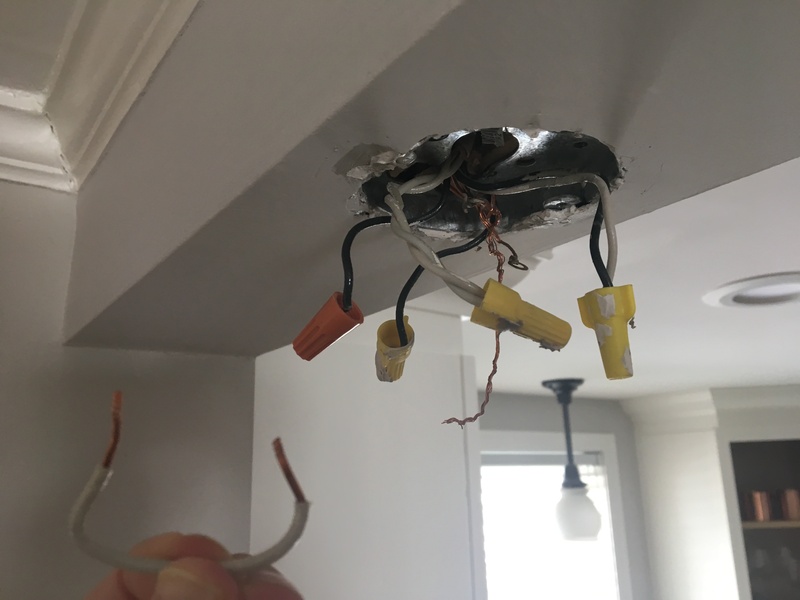 How should I connect my light fixture? Is it safe to wire a light junction box to a plug (which could then be plugged into a switch-controlled outlet)?